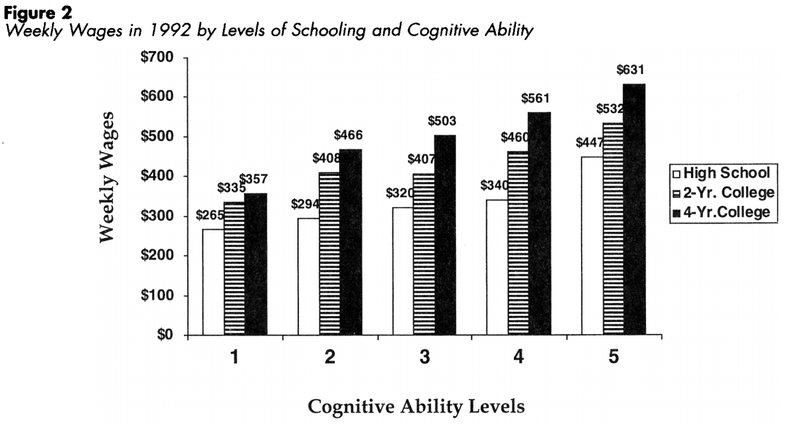 The figure below is from Schooling, Intelligence, and Income (1997, American Psychologist) by Ceci and Williams. Cognitive ability has a strong impact on earnings at each level of educational attainment. Don't forget to respond to the reader survey. I always enjoy the topics on this blog. However, Isn't this topic a comment on the obvious? What if instead, the headline were "cognitive ability and education have no affect on income"? Wouldn't that be a surprising discovery! If education had no effect on income it would be quite a disappointment to millions of families and individuals not to mention the whole of education as an institution. I think outliers would be more interesting; those that have masters and doctorate degrees and earn very little, and those who with only a high school education or dropped out of college who did particularly well. Comparing similarities and differences between these two groups might prove more revealing about what contributes to income. More posts on the prospects of genetic engineering and embryo selection would be appreciated. Progress on nucleotide morphisms and alleles found would be nice Steve. The NPTN gene supposedly accounts for 0.5% of ability variation. The recently discovered KL-VS gene increases IQ by six points. I appreciate this blog but more prospects and updates on quantitative genomic information and not this(I know it's quantitative but we know what a high IQ does on income it doesn't require a high IQ to assume this date based on the mountains we already have on this). It should be obvious, but a lot of people insist that the IQ-income correlation, particularly at the high end, is simply a function of high IQ folks achieving more (or better) schooling. Thus it's nessecary to show that even when equating education, high IQ people are more prosperous. This shows that IQ tests really do measure intelligence (the ability to adapt) and not simply book smarts. If you're pro-capitalism, it also validates the free market because it shows the economy rewarding people for some intrinsic merit (IQ) and not just credentials. This chart explains a lot about power of higher IQ in free market economy. Based on anecdotal experience around my school mates and working colleagues, smarter ones always end up with higher income and total weath even though they hold identical jobs with same job income. The smarter ones always make correct financial desicion and investment. After decades, smarter ones often command higher investment income almost equal or even above their jobs income. Your accountant can reveal a lot. "outliers would be more interesting"
"After receiving his PhD ... He then managed a bakery for two years." in a Subway sandwich shop." In my university days I used to go to a low cost Chinese take away shop and at the waiting area there were stacks of solely physics research journals. NOT what the GSS says. It would only "validate the free market" if you could show that nothing similar happened in socialist states. An "antiracist" would claim the chart only shows that the labour market discriminates against blacks at every educational level. Well, a lot of white proletariats would not like this either. Believe or not, quite a lot of them try to deny power of intelligence also. This finding really makes them butthurt. I got an insight into the IQ - employability connection when I was in the Army. On the second day I was in the Army the sergeant's called for a volunteer for a job that required a college degree. No takers. Then the asked for anyone with three years of college. Again no takers. Finally they sought those who had had two years of college. That was me. I volunteered for this 'special job' that required a college man. So I was stationed at the door of the dental X-Ray machine room. When a trooper had his teeth X-Rayed he was told to spit the exposed film into my hand. I spent the next hour or two catching spit covered exposed X-Rays in my bare hand. A real high dignity job. Afterwards I asked the sergeant why you needed a college degree to be a living spittoon. He said with total sincerity - 'We find that college men require less training'. I'm sure he was right. Even for simple jobs a smarter guy will make fewer mistakes. There are mountains of data showing that g (what IQ tests measure) is a predictor of even very simple tasks, and much of it comes from studies done by the US army. The AFQT is actually a good predictor of whether army cooks (equated for months of experience on the job) will be able to make jelly rolls (Jensen, Straight talk about mental tests). "Not even lengthy experience (5 years) eliminates differences in overall job performance between more and less bright men (Schmidt et al., 1988). A large study of military cooks, repairmen, supply specialists, and armor crewmen showed that performance may converge on simpler and oft-performed tasks (Vineberg & Taylor, 1972, p. 55-57). However, even that limited convergence took considerable time, reflecting large differences in trainability. It took men in the 10th to 30th percentiles of ability about 12 to 24 months to catch up with the performance levels on those tasks that were exhibited by men above the 30th percentile with no more than 3 months’ experience on the job." http://blog.kittycooper.com/2014/05/klotho-a-gene-for-longevity-and-alzheimers-protection/ has some good information on KL-VS.
- KL-VS has a heterozygote advantage (for survival). They quote a 1.43 fold increased survival to 75 for the heterozygote with a 2.70 decrease for the homozygote. A similar effect was observed in two other populations. - They define KL-VS as "defined by the presence of six SNPs in complete linkage disequilibrium." Two of these SNPs (rs9536314 for F352V and rs9527025 for C370S, from 2014 paper, does anyone know the other four?) result in amino acid substitutions F352V and C370S. Can anyone with more expertise comment on this? It seems to me that six SNPS in linkage disequilibrium would be problematic for getting significant p-values (except perhaps for LASSO driving coefficients to 0?) and that the heterozygote advantage would cause difficulties for additive models (though the homozygote frequency looks low enough that it may not be an issue). Regarding the IQ connection, the 2014 paper looked at subjects from 52 to 85. It is possible the IQ effect observed is really a longevity effect which would not manifest for IQ at earlier ages. Has anyone looked closely at these SNPs for their IQ effect at other ages? On a related note, do existing GWAS/GCTA ever collapse groups of SNPs in linkage disequilibrium into a single trait for analysis?